Authentically detailed action figure based on the film The Hateful Eight. The Hangman stands about 12-inches tall. Features 30 points of articulation, interchangeable hands, and cloth and leather clothing. Includes an excellent likeness of actor Kurt Russell, handcuffs, 2 guns, and a coffee pot! 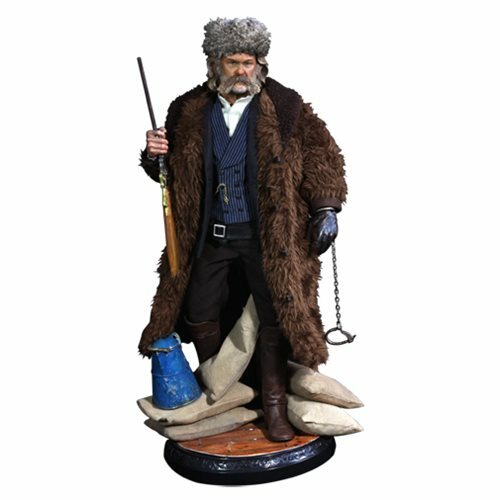 From his solemn expression and magnificent beard to the big furry coat, the Hateful Eight The Hang Man John Ruth 1:6 Scale Action Figure stays true to the character with the detailed likeness of actor Kurt Russell. Weaponry is one thing a bounty hunter cannot live without, so the figure features Ruth's handcuffs, two guns in detailed likeness, and the most dangerous weapon of all - a pot of hot coffee! The Hangman from the film The Hateful Eight stands about 12-inches tall and features over 30 points of articulation, 6 pairs of interchangeable hands, detailed cloth and leather clothing, and a stand for display.